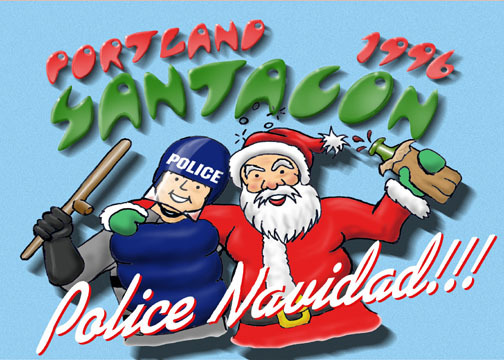 In 1996 The Portland Cacophony Society hosted Portland Santacon ’96, the third annual Santacon event (the first two took place in San Francisco). 40 Santas from the San Francisco Cacophony Society boarded a Southwest Airlines flight to join other Cacophonist Santas from around the country who were all converging in Portland, OR. I brought my video camera along, shooting the Santarchy as it unfolded, chronicling the non-stop cat-and-mouse game between the naughty Santas and the police. I edited the video I shot into my 40 minute Dragnet-style documentary “You’d Better Watch Out: Portland Santacon ’96”. I used to send copies of the video to people planning Santacons in various cities, as a kind of Santarchy training video but now you can watch the entire video online. Along with The Cacophony Society, the documentary features Art Cars, 24 Hour Church of Elvis, plus Chicken John and his Circus Redickuless. Here are the production credits, along with a review by Jack Boulware. The video was shot on HI-8 and manually edited on SVHS (no fancy non-linear editing) at Film Arts Foundation (FAF) and Artists’ Television Access (ATA). UPDATE: For more Santacon videos from the archives, check out Weird America’s coverage of San Francisco Santacon 1995 and Los Angeles Santacon 1997.